Dearly beloved children of the light. As we have said to you many times prior, there are major energetic changes indeed moving closer and closer to your GAIA, the event is inevitable, yet most do not comprehend with the human mind what this event that we are all referring to is, and so, let us briefly explain to you its importance and what is about to sweep through your planet. Let us reassure you that the destruction that many of you are seeing in their third eyes, is the destruction of the old system of thinking and the old system of belief, for there indeed is a new thought process that is originating inside your hearts, a new heart code that is exploding from within, and bringing you into the alignment with THE ULTIMATE TRUTH. Truth that all of you are magnificent beings, capable of creating worlds close in magnitude to the one that you are presently finding yourself on. You are indeed awaking to your heart code, you area wakening to the real truth, which is, that you are in control of your realities, and you need not anyone tell you the what, how, when and why. 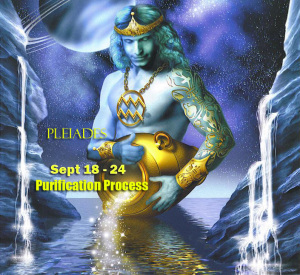 Technically what is about to occur on your planet is the PURIFICATION PROCESS. Many portals on your planet will open up and the energy from these portals will rise to the central point in the middle of the earth through its axis, the wobble will be changed a few degrees, many events of various natures will occur. Massive cleansing process is going to take place. All earth ancient portals systems shall activate significantly and release the knowledge that has been laying dormant for eons. Your scientists are going to discover proof of what we are talking about here to you. More and more newspapers will report the new findings of scientific experiments to support all the “theories” that we lay forth before you. But let us return to the dates at hand. September 18th – the 24th of your earthly time, what is about to occur on your planet is the gates yet again are going to open, but this time the energy that you will experience will not be coming from any celestial body but your own GAIA. What you are about to experience is major pruning, sweeping of your earth, energetically, physically and mentally. Please understand that the changes that are about to take hold of your planet are the changes that have been set into motion many years ago, and so with the quadruple affect you are moving closer and closer the unification of the minds, to the unification of the system. What we mean by this is NOT the idea that all of you will begin to think exactly the same, on the contrary you are about to awaken to your true magnificent selves, awaken to your hearts, and to remember the true reason that you are all now here, to awaken to your creativity, to awaken to your individuality, and yet ONENESS.. to understand that all of you are here as pieces of a puzzle in order to unite these pieces to build one whole. One whole – full of a multitude of colors, vibrations, musical tones of such variance, that once put together, will flow like a river in the same direction, in the direction of love, light, understanding, compassion, and abundance. That is not to say that you must give anything up, except one thing the idea that you are all separate, for you are not. For you are all one and the same, but you come with different vibrational frequencies. And so, by giving up your hatred for one another, by forgiving each other, by forgiving yourselves, you are moving closer to finally playing together in unison a beautiful melody of freedom from lack, freedom from war, and freedom from dis-ease. For once you are in tune with your own selves, once you are in tune with your own creative forces, once you are following your hearts code, and living out your life as you are meant to be , as you have decided to do, it is then that the puzzle can finally be put together and the melody can finally be unleashed form earth and travel fast into the universal frequency of love, and it is then that your earth, and human beings, can finally join into the interplanetary confederation of light. And so, we will repeat this again and again, hear our call, hear our tune.. you are to forgive, each other, you are let go of misconceptions towards YOUR SELVES, and those around you.. you are to stop trying to change everyone around you and you are to look deep within yourself and begin with you. Do know that those of you are who are here to activate the grids, who are here to activate the portals, will be called to duty, be prepared, we ask that those of you and you know who you are, to be prepared by drinking enough fluids and by staying attuned to the notes to the sounds entering your hearing channels, i.e. your ears, you will hear a variety of sounds , sensations, you will hear different tones, you will feel heaviness in your ears, you will feel quick changes in the atmospheric pressure around you, it will feel as if something is being pressed up against your energy fields, you will feel energy drops, sudden tiredness, sudden alertness, sudden noises that normally do not hear. All these are calls for you to pay attention for you to attune to yourself. For you are being called into action, action which will take place from the 18th to the 24th of September. Action to activate the grids of the portals of GAIA. Please understand that this is a STEP, this is merely a commencement of the event, a preparatory step, and you will be called to duty many times over, throughout the duration of your present incarnation. For not only are you here to activate the grids, but also to lead assist humanity as they move from one dimension to another, as they move closer and closer to the understanding of their MULTIDIMENSIONALITY.